It’s Monday. 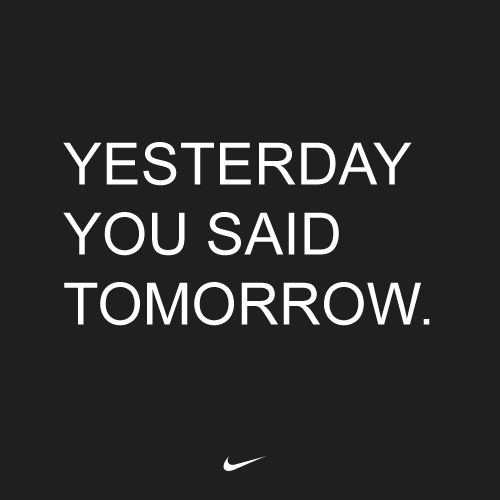 Did you tell yourself you would start eating right and exercising today? Monday was the mother of all starting lines. THE day to begin. Everybody knows it’s better to start a new fitness plan on a Monday. “We think of Monday as the January of the week. It’s a call to action built into every calendar, giving you 52 chances for success.” says Sid Lerner, founder and chairman of The Monday Campaigns, a nonprofit initiative in association with Johns Hopkins, Columbia and Syracuse Universities. I did NOT deserve to weigh 210 pounds. I did NOT deserve to get winded trying to play with my kids. Well. Actually, the way I was eating and taking care of my body, I did deserve it. Because those are the lousy excuses and rationalizations I used when I had the mentality that says fitness is a goal to be achieved. Something I did for a period of time until I got to a certain weight or size. When I was finished, I could go back to my “normal” life of thoughtless eating and neglecting my body. But if I’m striving to be a good steward of the body God has blessed me with, THERE IS NO FINISH LINE. I’ve gone through different stages since I began incorporating fitness into daily life. Sometimes I focus on strength training – I’ve gone to a gym, I’ve gone to local fitness trails and now I work out at home. For a few years I worked with a personal trainer two to three times per week. Before I tore my MCL and strained my ACL in December, I was doing yoga and I loved it so much I know I’m going back. But my constant -through injury and weather and lapses in motivation – has always been walking, sometimes outside, sometimes on a treadmill with an incline. How do YOU incorporate fitness into your everyday life? If you currently don’t, here’s the thing. You don’t need to buy a gym membership. You don’t have to buy the PX90 or Shred DVDs and spend every minute “hating it” as I read on another blog last week. You don’t need to buy a BowFlex or turn your extra bedroom or garage into a home gym. Before you spend a lot of money on the accoutrements needed to accommodate your latest exercise plan, I’ll give you the same advice I gave my sister: “Find out if you are ready for the commitment. Tests have shown it takes 21 days to make a habit. Do 10 pushups a day for 21 days. You don’t have to do them all in a row, break them up if you can’t get through the full 10. Do modified pushups on your knees if you’re a beginner. IF, after three weeks, you’ve discovered that you made it, THEN think about throwing money at this problem. In the meantime, consider this: The SINGLE BEST thing we can do for our health only requires one thing: a good pair of shoes. I’m amazed at the measured significant improvement seen in SO many areas of our health!! Check out the statistics in this video! Short, but PACKED with info! Here’s the deal. I don’t have to exercise every day for the rest of my life. I need to do it TODAY. And tomorrow, I’m going to tell myself the same thing. ← sometimes, tired is a state of mind.